THE SCENE: In 1992 the much-loved Public Enemy tasted their first cup of Haterade after releasing the concept-free semi-remix album Greatest Misses. Undaunted, they returned in 1994 with the brilliantly bitter Muse Sick-N-Hour Mess Age, a fusillade of finely tuned aggression and progressive noises. 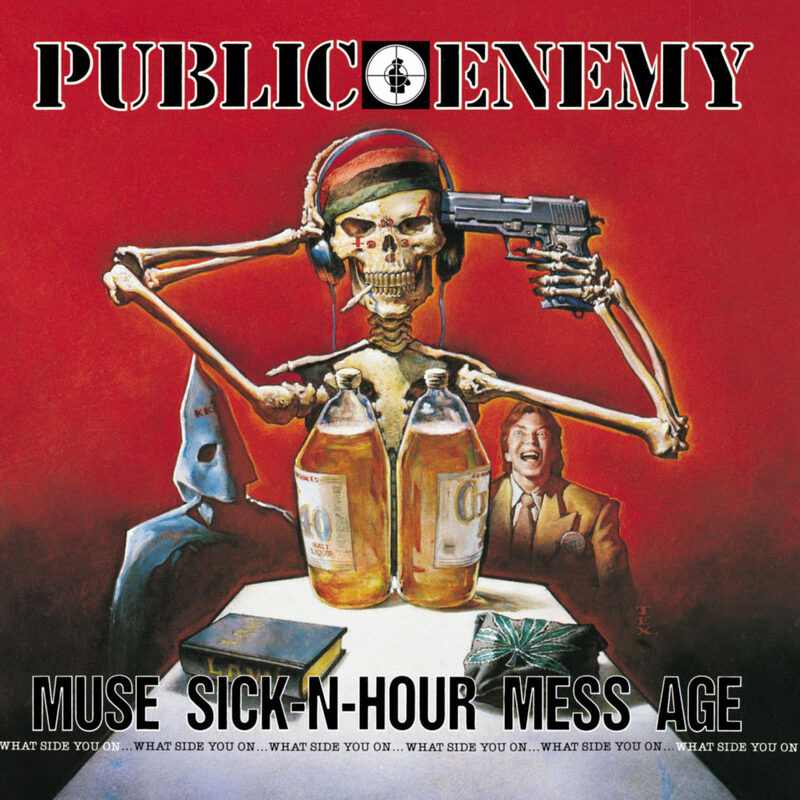 PE focused its rage on the supply chain of the record industry: morally bankrupt record companies, elitist and impotent music journalists, and the audience that supports them both. Or to put it another way, they had a big problem with their own label, critics and you, personally. So had you just stopped purchasing gangsta rap and the culture of consumer crap it represented, they wouldn’t have had to record such R&B diatribes as “Give It Up”. Bad consumer. Stop it. The utter uselessness of music critics is demonstrated in the hazy mule train of “I Stand Accused”, while PE publicist Harry Allen dissected the utter uselessness of major labels in “Harry Allen’s Interactive Super Highway”. Nine years before Apple’s iTunes Music Store debuted, Allen sharply predicted the legal sale of digital music and how it would empower the creators and destabilize the record industry. The intensity of these messages is matched with unique sounds, live instrumentation and explosive, challenging rhythms. The eco-warning “Race Against Time” cleverly sloooooows down the beat to make its point. “Aintnuttin Buttersong” laments the propaganda of the “The Star Spangled Banner” while paying homage to Jimi Hendrix’s Vietnam-era interpolation, chaotic guitar included. The concept of “discovering Indians” returned with the hovering incendiary metal of “Hitler Day”, which rowdily recasted Columbus Day as a celebration of a 500-year genocide. THE FALLOUT: PE’s label Def Jam were not pleased with the album (shock!) and barely promoted it. Critics were sharply divided, depending if they felt picked on or not. Although “Give it Up” was a minor hit, the audience really, really wanted to keep buying that G-Funk, and Muse Sick-N-Hour Mess Age stalled. Public Enemy didn’t record another non-soundtrack album for five years, but when they did they took their own advice. 1999’s There’s A Poison Goin’ On was released on their own label, as an MP3 album. Muse Sick-N-Hour Mess Age is an extremely gutsy and extremely engaging album. Forward-sounding, retro-leaning and wholly unique. NEXT WEEK: Saul Williams would like some words with you.